At Henry’s Metal Polishing, our reputation for high-quality craftsmanship in both fabrication and finishing has earned us the business of many loyal clients in the area. One of our ongoing projects involves the production of stainless steel frames for round, square, and rectangular tables used in commercial furniture installations. The 3/8” x 1.5” raw material we use to make these tables is dropped shipped to our facility from a local industrial metal supplier. Our first step is to pre-finish the 304 stainless steel prior to cutting the individual pieces to length on our cold saw. If the table is round, we send the pre-finished material to a local vendor to form the loop and then finish the workpiece to the desired dimensions here at our shop. Additional in-house operations consist of drilling the holes, tapping the threads, and then welding the legs onto the top stretcher. Afterwards, all of the welded areas are ground to create a smooth surface. We then use a series of polishing and buffing wheels to achieve the #8 mirror finish. In some situations, we get a request for a #4 finish, which we can also readily accommodate. We inspect all finished products for dimensional accuracy and weld integrity, then wrap them in special foam packaging to prevent damage during transport to the customer, who will then attach a top to the table frame before shipping it to the end user. 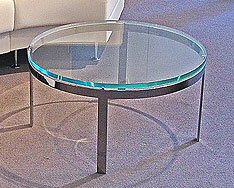 We produce these table frames in numerous sizes. 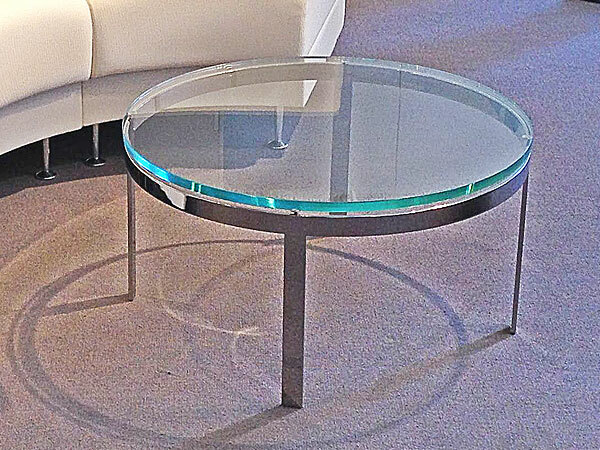 Round tables range in diameter from 20” to 36”, while square tables can be anywhere from 20” to 50” on each side. We build rectangular versions that range in size anywhere from 24” to 72” in length x 18” in width, and on all workpieces the leg height is usually 15”, with variations from time to time. To ensure proper fit of the tabletop, we produce all frames within ±1/32” tolerances. If you are interested in learning more about this project or our fabrication and polishing capabilities, contact us today. 3/8 in. x 1.5 in. Round tables from 20 in. to 36 in. in diameter with legs usually 15 in. high. Rectangular tables from 24in. x 18 in. all the way to 72 in. x 18 in. with legs usually 15 in. high. The vast majority of these tables are finished in a #8 mirror finish. From time to time, a request for a #4 brushed or satin finish also comes in. Usually 4 weeks lead time. For custom orders, lead times usually are 6 weeks.